Disabilities, handicaps, and problems with mobility can affect people of all ages. Making your home more handicap-friendly requires some changes to make accessing various areas of the home easier and more usable. The best place to start is by considering the different areas of the home and which ones you access on a regular basis. You do not have to update the home all at once, and you are free to make changes as they fit into your budget. 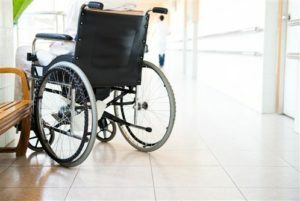 Floors – Both rugs and deep pile carpeting can present problems for people who have to use wheelchairs and walkers to get around. Removing the carpeting and rugs, and replacing them with low pile carpeting, linoleum, tile, or laminate or vinyl flooring makes it easier to get around and costs much less than hardwood floors. Doors – The location of locks and doorknobs can present problems for some people. Lower doorknobs to the desired height and use fillers to fill in locations where the doorknobs and locks were. You can also special order doors with the holes predrilled in the desired locations. Doorways – Doorways can be problematic if there are not wide enough. If you are on a tight budget and cannot afford to pay a contractor to widen the doorways, an alternative is to remove the door and door frame to widen the space. Another option is to replace traditional swing-type doors with sliding doors that are easier to open and close. Bathroom – The bathroom presents many challenges for people with mobility issues and disabilities. Install grab bars on the walls to make it easier to get up and down around the toilet. Replace the bathtub with barrier free bathroom shower system, complete with a seat, adjustable shower wand, and grab bars. Kitchen – To make the kitchen more accessible, lower the countertops and sink. You can also remove sections of under-counter cabinets to eliminate obstructions for people in wheelchairs. Appliances should be easy to access, such as replacing a stove/range with one where the knobs are all on the front of the appliance. Pull out or roll out cabinets and storage units work well, too. Stairs – Homes with stairs are especially challenging for people who are wheelchair bound or who use a walker. Install a ramp at the entrance of the home. In two-story homes, a lift can be installed to move the person up and down the stairs, while they remain seated. Miscellaneous – Light switches, outlets, and thermostats should all be moved to the desired height so a person can easily reach them. Moving could require splicing electrical wiring and adding additional length. However, sometimes there is already slack electrical wiring, so it only requires moving the switch or outlet up or down to its new location and replacing a small section of drywall. Many of these changes can be done with help from your friends and family. For modifications outside your abilities, remember to use a qualified contractor for the type of work you need done. Lastly, check with your local state and government agencies and nonprofit agencies, as there could be special programs available to help pay for some or all of the costs to make your home handicap accessible. 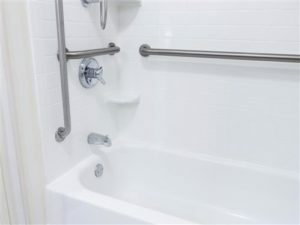 For more information about handicap accessible shower kits and bath enclosures, please feel free to contact American Bath today, by calling 888-228-4925 to speak to a representative.